Calls to decrease the world’s dependence on coal as an energy source are well intentioned. Lower use would reduce greenhouse gas emissions, and less demand would lower the environmental risk of coal mining. However, as the world moves away from coal, South Africa will need to consider the implications. The country depends heavily on the mineral as a source of economic value, employment and energy. It might come as a surprise to many that coal is now more important to the South African economy than gold. The coal mining industry contributed approximately R37 billion to the economy in 1993, with gold contributing R115 billion (value added at constant 2010 prices). In 2013, coal contributed R51 billion to South Africa’s economy, compared with gold’s R31 billion1. Measured at current prices, coal is now king. The mineral’s contribution to overall mining value added rose to 22,5% in 2013 from 17,4% in 1993. Platinum group metals (PGMs) came a close second in 2013, at 21,0%. Gold’s contribution fell to 18,5% in 2013 from 51,1% in 19931. In terms of mineral sales, coal contributed 27% to sales in 2014, followed by PGMs (21%), iron ore (16%) and gold (13%)2. South Africa is the fourth largest coal producer in the world, according to the South Africa Yearbook 2013/14, published by Government Communications3. 28% of South African coal production is exported. With an estimated 116 years of proven coal reserves remaining4, the mineral is set to remain a valuable resource for South Africa’s economy for as long as demand remains. The coal mining industry is an important employer. 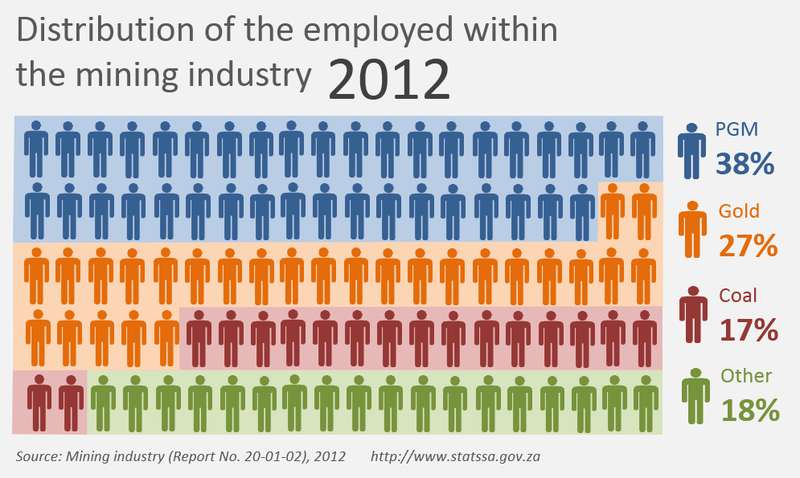 The mining industry as a whole employed a total of 535 457 individuals at the end of June 2012. The coal mining industry was the third largest employer, employing 91 605 individuals (17% of the total mining workforce). The PGM industry ranked first (206 764 or 38%), followed by gold (144 084 or 27%)5. The number of employed has grown. Employment in the coal mining industry rose by 75% between 2002 and 2012, falling a close second behind the PGM mining industry (78%). Employment in the gold mining industry dropped by 29% over the same period4. Coal is South Africa’s dominant energy source. 77% of South Africa’s energy needs are provided by coal, according to the Department of Energy6. Eskom produces 95% of electricity used in South Africa7, and its coal-fired stations produce about 90% of electricity produced by the utility8. 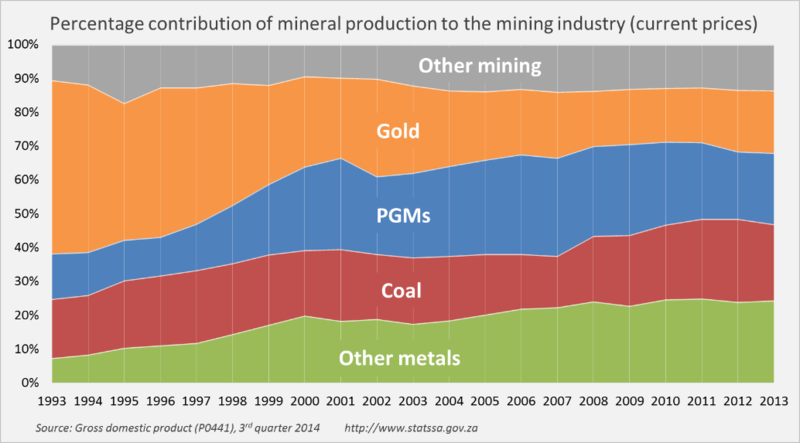 2 Stats SA: Mining: Production and sales (P2041), April 2015 (click here). 3 Government Communication and Information System (GCIS): South Africa Yearbook 2013/14 (click here). 7 Stats SA: Electricity generated and available for distribution (P4141), April 2015 (click here).